These two books by one of the preeminent environmental authors of recent times contain many treasures, but perhaps their greatest virtue is the light they shed on the fallacies of thinking that underpin so much modern-day debate. The late David Fleming was dismayed by what he saw as the poor state of contemporary public discourse. At the outset of Surviving the Future, he laments how drastically most people’s ability to distinguish between “honest argument and fraud” has waned. He goes on to argue that we all could use a refresher on “the rules of thinking, informal logic, judgment and reasonable conversation” if we are to engage in useful debate about the crises now bearing down on us. Fleming died in 2010, and the posthumous publication of Lean Logic and Surviving the Future marks the first attempt to present his work to a wide readership. Those who knew Fleming well describe him as a consummate perfectionist who spent three decades tirelessly reworking his masterpiece (i.e., the book that would eventually become Lean Logic). Ultimately, it would be Fleming’s longtime friend and colleague Shaun Chamberlin who would undertake the task of preparing the book for publication. Yet Chamberlin knew he had a tough assignment, owing to Fleming’s unique genius. By all accounts, the man had been known for an encyclopedic but decidedly non-linear mind that could leave others feeling lost, even as it captivated them. Thus his book risked being too inaccessible. Chamberlin’s answer to this dilemma was to assemble an abridged, more linearly oriented version of Lean Logic to serve as a companion volume. This is the book that became Surviving the Future. Surviving the Future‘s front cover and title page refer to it as a story from Lean Logic, and indeed the book’s structure is more narrative- than dictionary-like. In an effort to help orient readers who are unfamiliar with Fleming’s ideas, it begins by outlining the origins and main facets of humankind’s present situation as the author saw it. The remainder of the book is divided into three parts, titled respectively “A Framework for Community,” “Rediscovering a Life of Place and Play” and “The Path from Here to There.” With less than half the page count of, and smaller dimensions than, the book from which it’s derived, Surviving contains only a fraction of the original content while still hitting on all the key points. As such, it’s an ideal first foray into Fleming’s work. Yet this sort of initiatory text isn’t necessary for all readers. If you already have a good grasp of the problems entailed in trying to pursue infinite growth on a finite planet–from following the work of authors like Richard Heinberg, James Howard Kunstler, the late Michael Ruppert and other figures in the peak oil/sustainability movement–you’ll find yourself at home in Fleming’s magnum opus even if it’s the first work of his you’ve ever read. Like the above-mentioned authors, Fleming foresaw that in the early decades of this century, industrial economies would come to grief as their need for ever greater flows of nonrenewable resources ran headlong into the reality of declining resources. Fleming, a Ph.D. in economics, saw the much-vaunted market economy as suffering from numerous fatal flaws, chief among them its need for perpetual growth. His objective in writing Lean Logic (originally titled The Lean Economy) was to furnish some principles by which a replacement for the market economy might be fashioned. This new economy would, by necessity, be the antithesis of its predecessor. Whereas the market economy had been taut, competitive and endlessly growing, the Lean Economy would be slack, noncompetitive and steady-state. Of the three qualities just mentioned, slackness is especially important, for it affords an economy more choices and a greater ability to recover from shock in an era of material scarcity. 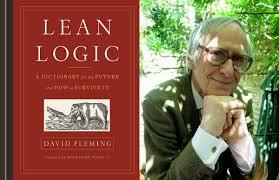 As reflected in the title Lean Logic, the ideal of leanness pervades Fleming’s writing. Fleming believed that in order to effectively face the hard times ahead, people would need to employ what James P. Womack and Daniel T. Jones of the nonprofit Lean Enterprise Institute (LEI) refer to as “lean thinking.” The aim of lean thinking is, in a nutshell, to “creat[e] more value for customers with fewer resources.”* To this end, it eschews top-down management, which is inefficient and inimical to collective problem solving, in favor of a team-centered approach. Since we’re entering into an age in which efficiency, resourcefulness and adaptability will be at a premium, it’s easy to see the appeal of embracing this management model on a societal scale just now. Lean Logic brims with ideas for applying it to a wide array of human pursuits, from construction to law and order to transport. One thing that becomes increasingly apparent the further one progresses into these books is Fleming’s terrific ease in handling a broad range of subjects. He deals just as capably with philosophy, linguistics, semiotics, historical theory and systems thinking (to name only a few fields) as he does with economics. A sense of the breadth of his inquiry can be gleaned by reading the titles of some of his essay-entries. In particular, the ones titled “Carnival,” “Dance,” “Eroticism,” “Narrative Truth” and “Hippopotamus” may at first glance seem far afield from ecological economics, but Fleming brilliantly ties them into the larger picture. Oil depletion is a key aspect to the existential crisis in which our civilization now finds itself, and Fleming was among the first to try to warn people about the threat that it poses. Accordingly, his discussions of the issue in Surviving and Lean Logic befit someone who has spent most of a lifetime studying it. In keeping with its condensed nature overall, Surviving supplies a bare-bones outline of the oil situation. Its companion book, however, contains a lengthy entry titled “Energy Prospects,” along with separate, in-depth assessments of fossil fuels, nuclear energy, renewables, energy descent scenarios and other related topics. The one caveat is that some of the information has become dated. For example, one naturally can’t look to Lean Logic for the latest developments in the U.S. shale boom that has temporarily bolstered global liquid fuels production, since Fleming’s thoughts on this phenomenon extend no further than the year of his passing, 2010. Like oil depletion, the subject of climate change is covered much more comprehensively in Lean Logic than in Surviving. The entry in Lean Logic describes in detail each of the main greenhouse gases, including their attributes, sources and relative concentration levels over geologic time; explains how the natural carbon sinks that pull excess greenhouse gases out of the atmosphere are diminishing; chronicles the history of abrupt climate changes; and elucidates feedback loops that are leading to an ever greater acceleration in the rate of change. The one thing that I was surprised not to see mentioned was the tremendous propaganda campaign underway to discredit climate science. Considering how successful this campaign has been in confusing a significant fraction of the population about the reality of the crisis, I think not addressing it is a mistake. The omission is all the more puzzling given Fleming’s penchant for pointing out the logical fallacies propagandists use to sway public opinion. Among the many feathers in the cap of Fleming’s legacy is his development of the Tradable Energy Quotas (TEQs) concept, which is almost certainly the most influential and widely studied personal carbon trading scheme to have been proposed so far. Surviving doesn’t get into TEQs, but Lean Logic dissects them in great detail and makes a persuasive case for their potential to both reduce greenhouse gas emissions and promote equitable access to energy. Along with Fleming’s seminal contributions to the sustainability field and his delightfully multidisciplinary bent, I admire his propensity for referencing ancient myth, art, fiction, poetry and classical music. It was the following passage from John Milton’s Paradise Lost that inspired him to use the word “torments” in describing the predicaments now facing humankind: “Our torments also may in length of time / Become our elements.” Fleming also poignantly references Franz Kafka’s novella The Metamorphosis in his dictionary entry of the same name. He defines metamorphosis as “[a] metaphor for the transformation that overcomes people when they surrender their judgment to a group, to a managerial institution, to a complex bureaucracy, or to a government, as the price of belonging to it.” For him, the man who turns into a cockroach in Kafka’s tale, and who thus loses his capacity for sentient thought, stands for anyone whose critical judgment has been snuffed out by assimilation into an institution. There is so much more to these books than could possibly be hinted at in a review. Surviving the Future is laudable for the poetry with which it distills Lean Logic down to its essence, while the latter is as absorbing as it is massive. Both are fine additions to the reference library of anyone passionate about sustainability. * “What is Lean?,” Lean Enterprise Institute, www.lean.org/WhatsLean/(accessed Dec. 12, 2016).